The Whitecaps were seconds away from earning a win after playing a man down for the entire second half, but a disastrous own-goal by Doneil Henry allowed TFC to escape with a draw and return home for next week’s second leg of the Canadian Championship with two precious road goals. 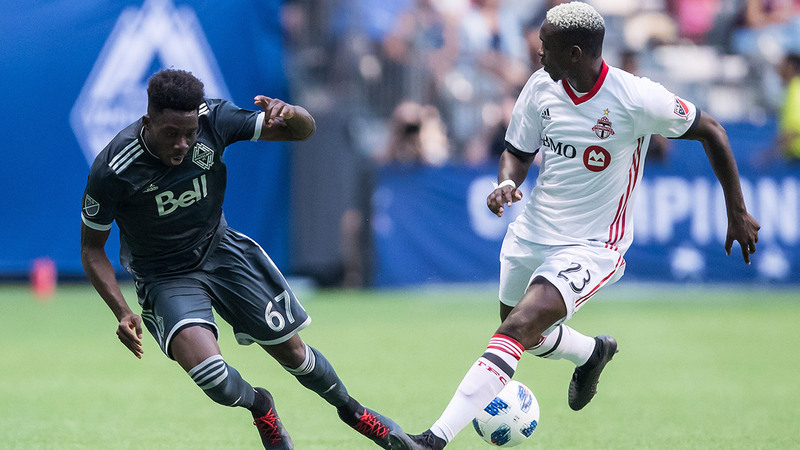 Forced to play the final 45 minutes with 10 men, the Whitecaps dominated Toronto in the second half, using their speed on the counter to get in behind the visitors. Alphonso Davies, in particular, showed flashes of brilliance — at one point he went on a lengthy run that he started inside his half, breezing past two TFC defenders before forcing a fabulous save from goalkeeper Clint Irwin. Toronto had the numerical advantage, but it was Vancouver who dictated the pace of the match, playing narrow and maintaining a compact shape to frustrate TFC forward Jozy Altidore at every turn. Canadian Russell Teibert was immense in central midfield, serving as the Whitecaps’ release valve by holding onto the ball and giving his defence time to reset, and as the pivot in launching attacks. It was his ball that released Erik Hurtado in on goal alone — Hurtado beat the offside trap and kept his composure as he cooly finished past Irwin in the 84th minute. That was it. Vancouver had the game won. Toronto had the life knocked out of them. There was no coming back for the MLS Cup champs after a lethargic second-half display. But Henry lost his cool and couldn’t properly deal with a ball played across the box, directing it into his goal in the final seconds to allow Toronto to escape with a valuable road draw. It was far more than TFC deserved on the night on the balance of play. The Whitecaps will be kicking themselves after letting this one get away from them in such dramatic fashion, and now face the daunting task of having to win in next week’s return match at BMO Field. Just before halftime, the ball moved past Vancouver’s Felipe in the middle of the field, and he quickly turned in an attempt to regain possession. The Brazilian went studs up on Marky Delgado for the 50/50 ball, catching the TFC midfielder in the ankle. Referee David Gantar had a clear view of it and reached straight for a red card, and Felipe was given his marching orders, forcing the Whitecaps to play a man down for the second half. Vancouver coach Carl Robinson was incredulous on the touchline, and he had every right to be. While it was a late and clumsy challenge by Felipe, it was hardly malicious or dangerous. A yellow card should have sufficed, especially when you consider Felipe didn’t catch Delgado that high up the leg. Gantar, though, viewed things differently, and Felipe was gone. It was an incredibly harsh decision from the Canadian referee, who should have managed the situation much better and taken a moment before immediately pulling out a red card. 3. Ricketts’ hand ball: What was he thinking? Toronto coach Greg Vanney will be sweating over the condition of Auro Jr., who left the game in the 64th minute with a hamstring issue. The Brazilian fullback only recently came back from a lengthy injury absence, and it would be a big blow for the Reds if he’s out for any length of time. More than Auro’s health, Vanney must be scratching his head over Tosaint Ricketts, who comically flung his arm in the air and was called for a handball that led to Vancouver’s opening goal. Kendall Waston was lurking behind Ricketts, but the Vancouver captain still would have had a lot to do just to get a shot on target had the ball fallen to him inside the box. Why Ricketts felt compelled to raise his arm in an obvious attempt to handle the ball when there was no real danger was a mystery. Kei Kamara didn’t care, though, as the Whitecaps forward converted from the spot to give the home side the lead. 90’+5’ GOAL! Toronto 2, Vancouver 2: In the dying seconds of second-half injury time, Toronto captain Michael Bradley launched a long, high ball into the box for Altidore, who nodded it into the middle. Henry was put under pressure by TFC forward Ricketts and the Whitecaps defender tried to clear the ball, but he managed to head it past goalkeeper Stefan Marinovic and inside the near post for the own-goal. Jonathan Osorio has now scored 15 goals in all competitions this season. Russell Teibert, Vancouver: The Canadian put in a solid shift in central midfield, especially in the second half, as he helped the Whitecaps dictate the pace of the match. Played a great ball over the top of Toronto’s defence in setting up what should have been the winning goal by Erik Hurtado.